POP has been picked as one of five finalists for our category in the Green Heroes Grant Program (sponsored by Green Works). The first place grant is for $15,000 and runners-up will receive $5,000. Ever pick up a 60' tree with a diameter of about 16" diameter? I have a timberjack, so that makes it easier - it makes the small bits cake. Since the saw was new, only started by the manufacturer, the dealer, and once by me. Back in the Autumn when I first got it. Got it up and running, finally, after 5 minutes of fighting the compression, 2 minutes of reviewing the manual (the advantage of a newer, better saw is all the extra features Phil's saw - which I started a few times the other day - didn't have), about 10 minutes of struggling, and about 10 minutes after giving up. The smaller section of the lawn ornament was done in 10-15 cuts, in about five minutes. The larger bits took about five minutes, most of which was spent wrangling the remaining log (diminishing from 30') so we could get it up on the jack and off the ground. The last 10' were murder to manipulate. Oy. After that, it was a matter of clearing the stuff in the driveway - of course, the thickest sections of the trunk. We rolled 'em aside, chopped the top of the other trunk (it poked out into the driveway), and cleared those limbs, raked the debris, dropped the snowplow back off, parked the truck, and brought my car back up to its normal spot. Deb will be able to zip right in when she gets back from taking Rachel to karate. Tomorrow, we'll clear the rest of the lawn ornamentation and maybe cut a bit of the other tree - it's not critical, but I don't want it falling on anyone or knocking over one of the smaller trees that caught it. First up, for those who don't stay up late or scroll way back through lots of stuff, Episode Six of Monday's Thirteen made it up with nearly two hours of Monday left to spare. And today, when updating, it lost the icon and the subject. I think it might be an issue with the older Safari down here. Anywho. Saturday, there was volunteering and some work - details posted soon. Sunday was Easter festivities - details posted soon, pictures posted here, here, and here. For the last month or so connectivity has been iffy and getting progressively worse. Thursday was Almost Dead, Friday was Mostly Dead, Saturday was Buried, and Sunday was Unplugged, until late in the day when I found out what it was. Maybe. Monday, which gets lumped into the holiday weekend, involved Brandonisms and the installation of a new lawn ornament. Today will involve some online work for the business that I wanted to do last Friday and much of the same for the household which was also supposed to be done Friday. Oy. It will also involve chainsaws and removal of aforementioned lawn ornament. Anyway, I was busy all day, as you might guess, and with the outages over the weekend, I didn't have any time to prep, but rest assured Monday's Thirteen will be up before it's Tuesday! Not all that long before, but it should make it! I had posted some of these updatia type things over the weekend - a time when some people allegedly don't read up on LJ. So, for a limited time only1, you can see the collected updatia of this past weekend, right here, with a handy, summarized group of links. Some of these entries are friends-only for various reasons, but the summaries are rated mostly safe for all ages (with a disclaimer regarding humor or lack thereof). I took a serious beating over the weekend, although much of it might be termed "enjoyable." First, as I was recovering from a mental beating at the hands of incompetent vendors carrying out the bidding of the state legislature here in PA, I had my head stuffed into a 3XL helmet, my body wedged into a slightly smaller space than it would prefer, and I then proceeded to pilot my scrunched body around a series of acute angles at 45mph. My arms were nearly ripped from my body by the attempts to aim myself in the right direction, and I probably lost a few pounds in sweat. This was good, because I think the weight loss improved my best lap time by about 10 seconds for each of the three heats, to come in solidly dead last most of the time. See here for detail, more or less. I spouted poetry later on Friday night, and It Was Good. No - Great. Greatest Hits, more like it. Been too busy to write new material, so in with Ye Olde. Had fun anyway. Woke up cold and getting colder, as power was dropped for at least 5 hours on Saturday morning. Only way to judge is that it did get colder as time went on, so it might only have dropped shortly before our 5am reference point. More on that, plus Rachel & Soccer and Justin & Music. Sunday, Justin and I started to disassemble a tree thats about 80' tall, although we were only dissecting bits that were about 60' off the ground, for the most part. Some limbs are starting to rot through - some have already fallen all around my car, and I'm not about to let the poor, dead thing have any more time to practice its aim. Anywho, we took down a small portion of it, and more will have to wait for the weekend and a little daylight. We joked that when we're done, we'll be Olympic-level athletes, but, realistically, we'd probably need to take down another two or three trees to get to that level. All that stretching and pulling and tugging on ropes has definitely compensated for the scrunching and bending and folding on Friday, so I definitely feel like a Norse god - yep, I'm Thor. Play-by-play here. 1: This Omnibus Edition of Weekend Updatia will expire when it's deleted, LJ croaks, the infrastructure in the country is destroyed via thermonuclear war leaving a few survivors in a post-apocalyptic condition similar to that made popular in so many 80's stories, or until entropy wins and the universe kicks back and chills for a while, which every may apply first. Some conditions and restrictions may apply, please see your dealer for details. I planted a number of native plants today - six, to be exact - and almost got half-way done before deciding to call it a night. The hard part was figuring out where everything should go. Most of the plants are not centerpieces or showstoppers - in fact, out of fourteen to be planted, ten are native ferns, and they are planted to help increase diversity. Growing in the wild, I've identified at least three species of fern on the property - Onoclea sensibilis (sensitive fern), Pteridium aquilinum (bracken), and - here's where the at-least comes in, as I haven't narrowed it down to a positive ID: Dennstaedtia punctilobula (hay scented fern) and/or Thelypteris noveboracensis (Parathelypteris noveboracensis) (New York fern) and/or Athyrium filix-femina (lady fern). Today, I added an Osmunda regalis (royal fern) and an evergreen Polystichum acrostichoides (Christmas fern). On an aside, the site all the fern links point to belongs to the Connecticut Botanical Society, and is an exceptional resource for native ferns... specifically to Connecticut, but everything I've been interested in there is also native to Pennsylvania. The royal fern has a prominent location down on the island in Stone Stream, where a Christmas fern I planted last year and some native ferns are starting to thrive. It's between a winterberry that might reach 10' around and a newly planted shrub, but as it can reach 6' tall on its own, it should fit in nicely with that crowd, especially once the river birch, katsura, and paw paws provide a nice ceiling. The new Christmas fern is located alongside Stone Stream above the pair of larger hostas - there's some sensitive ferns and other natives around there, but it will take on a prominent role, especially during the months where the deciduous ferns fall apart. The other four that went into the ground today were not ferns, all though one wants to be! The Stylophorum diphyllum (celandine poppy or wood poppy) - a native wildflower - is positioned along Spruce Alley, where the meadow spills down off the sand mound. It should reseed itself nicely there, giving us some nice yellow spring flowers before most of the meadow wakes up for the year and gets going. Across the stepping stones from the new Christmas fern, I planted a Physocarpus opulifolius (ninebark). It helps finish off the foundation planting, and, unlike most of the shrubs in the area around the porch, it provides a deciduous touch, and it does so with a beautiful peeling bark. Down near the royal fern, I had tried to transplant some Comptonia peregrina (sweet fern) from the bank a year or so ago. I didn't grab enough root - it spreads by suckers, and what I planted was, essentially, three rootless sticks. As this set of three sticks has leaves and roots, I expect it to do much better. One of the key functions of sweet fern - which is a deciduous shrub - is to fix nitrogen in the soil. It will improve the soil, even as it looks pretty good (like a dark fern with woody branches) and smells beautiful. The last one I'll list tonight was actually the first one planted, as it went in on the top edge of Bank Island, furthest from the house. It is an Ilex opaca 'Dan Fenton' (American holly 'Dan Fenton'), which is funny, because, as Louise at Edge of the Woods (who supplied all 14 of the plants) pointed out, it's a female plant. Dan Fenton may be honored by the name, but it really would have been more apt to name it Danielle... she should get along well with the male hollies, and make lots of nice berries to supply the birds with food. Busy weekend - after a busy Saturday (Top Sekrit portion thereof), we capped off the weekend with an event-filled Sunday. Before we got that far, though, we added a bit more on Saturday night. After Brandon went to bed, I introduced Rachel to D&D. Although Justin had played before, it's been a while. I managed to get their two characters to meet up, agree to travel together, and then I had three thieves ambush the canal boat they were travelling on. Unfortunately, I underestimated their abilities (they had 9 & 14 hit points, so I didn't want them dead right off), and Justin's cleric spiritual hammered the one on the far shore while Rachel's fighter managed to charge and take out the leader (who was supposed to be the toughest) and the other one, who was up ahead where the mule team was. Sunday, we spent most of the day at a martial arts tournament up near Camelback Mountain. We watched the end of the weapons forms - one guy did an excellent routine with the staff, another, with a sword, seemed to draw too slow. I'd like to think the latter's black belt was an indication of a beginner rank, but I highly doubt it. However, I do feel better about my own novice abilities - I was able to do the entire opening form in less time then he took to clear the blade. We watched the 17-34 year old forms. Rachel and some friends from her school went with their senseis to watch the kids sparring, and Justin and I stayed in our near-corner (mostly to attempt to keep Mr. B cornered; we should have received medals for our efforts at toddler-fu - I'm confident I would have snagged the silver, Justin was displaying his frustration at times and thus would have received the bronze. Of course, there was no real competition for the gold - Mr. B had that from the outset. Rachel and her friends left earlier than us - they went out for pizza; we stuck around to try to see the guy who was waiting to compete in the 35+ mens forms division, but we finally gave up on that and headed back. At home, we goofed off for a bit, and then went outside. We installed deer fencing around the summersweet and one of the three paw paws - both were hit by the deer in the past month. Last time, when we put up the other seven, we had a difficult time getting the posts in the ground. The metal ate into the rubber sledgehammer, and we had to mess around with rocks, holding them in place and thwacking them without hitting our fingers. This time, thanks to my dad's tool collection, we had a choice of three or four metal hammers. We opted for the heaviest one, and the only time we had trouble was when the spot we picked was directly over a buried rock. After getting the six posts in the ground, Justin traded jobs with Rachel and played with Mr. B while Rachel assisted with cutting and hanging the fencing on the posts. Justin and I relocated one of the wind chimes from the porch to a tree - partially to maybe startle deer from their munching, mostly because Deb didn't think it went with the other stuff on the porch. We were going to hang some of the lawn ornaments - three spheres of different sizes and three glass swirls, all with phosphorescent paint - but we didn't get quite as far as we would have liked. Our original plan fell apart (in its current form) when we realized the monofilament line we were using was only 8 pound test. I had thought it was 20, and felt confident that would support the heaviest sphere, as well as multiple items. After dangling the large one on its lead - and feeling the line stretch thin to snapping - we re-evaluated the situation. In the end, only of the three swirls is up, and it's likely to come down and be put back in a slightly different fashion once we work out the details. As it was getting dark, we gave up on doing more (which is good - will give us time to do it right). Tonight, we should be able to see if the area gets enough light to make them glow. Justin and I managed to get two more steps in on the back bank; hopefully we'll finish the last two tomorrow! In other news, the mayapple showed up - I was getting a bit concerned that it didn't make it through the winter. Some of the American holly are showing new growth, so that's a good sign. Bunches and bunches of the hemlock are looking good. Still waiting on the sycamores, I'm fairly concerned that the sweetgums aren't going to show up (to be fair, most of them seemed to be the victim of chipmunks or something like that), and the balsam fir and Serbian spruce trees are iffy. It's really dry out there. The ground is all crunchy underfoot, the exposed bits of dirt - even in the deep woods - are all cracked and rock hard. We're switching to watering-every-day mode for everything planted in the last year or so. The order from Musser Forests arrived recently, and, after sopping up some water from roots wrapped in newspaper, they were planted. This round was fairly systematically placed, each species getting a particular use, for the most part. Seven Myrica pensylvanica 'Bayview' (Northern Bayberry or Candleberry) were planted along the banks of the Rachel River, three on Driveway Island, two behind the mailbox, and two further down, between the dawn redwood and the forsythia. They'll help hold the bank together - they should be well out of range of even the most extreme flood (that we've experienced thus far,) but they should keep things from crumbling, and they should also do well when the bank dries out or if any salt is used on the road. Their berries are very waxy, and, as one of their common names implies, they were used in the Colonial days to make candles. A half-dozen Picea omorika (Serbian spruce) - very narrow, reasonably tall - add to the screening. Quoth Musser, "considered the most beautiful and adaptable of the spruces" these trees really do have a nice appearance. Two are placed down along the woods edge of Spruce Alley, where they'll join the Colorado blue spruces that give the area its name, as well as a couple of hemlocks, to provide privacy for us and our neighbors downhill - although these folk don't have the late-night parties of the previous owner, they'll still enjoy some privacy out on their large deck. One of the spruces will accent the path into the Back Woods, and another will be framed by hemlocks on top of the garden. Two others are on the narrow area between our driveway and the neighbors uphill - they accompany Norway spruces and an Austrian pine. One of the half-dozen Abies balsamea (balsam fir) also adds to that Driveway Island screen, a bit further down between the Scotch pine and another Colorado blue spruce. The others dot the edge of the wooded property from the Ivy Triangle to the Fire Pit. Even with them being dormant and fairly small - only a few feet tall, without a lot of branching - their fragrance can already be caught on the breeze. Their job is to help make the highway disappear - of course, the handful of hemlocks scattered along the back edge - along with the 95 or so I plan to plant in future years - will do the lions share of the work. A half-dozen Liquidambar styraciflua (American sweetgum) were scattered in the woods, with one down in Spruce Alley. 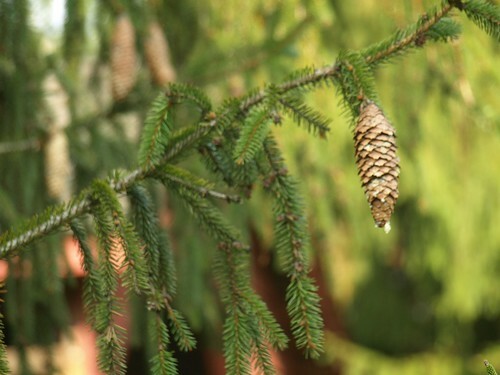 They add diversity to the woods - although I'll plant non-natives such as the Serbian spruce and other US natives like the balsam fir, I won't add anything to the woods themselves unless it is a native plant species naturally found in this area. Sweetgum fits that bill - it's also Justin's chosen tree (the two planted for him last year didn't make it, so these are essentially replacements.) Although lots of people hope not to get the "gumballs" and try to seek ways to sterilize the trees to avoid the spiked pods, I'm hoping for them - they make a great anti-slug mulch! Of course, they're 30-50 years away, if I recall. In the mean-time, they'll have beautiful star-shaped leaves that turn yellow, purple, and red in the fall. The half-dozen Carya ovata (shagbark hickory) finish off the planting for the season - they're scattered in the woods, with one pretty far down Driveway Island. They will take 25-30 years before they produce nuts, but they're an investment in creating an edible forest. I'm not entirely convinced they'll be practical - or even possible - to harvest, but they will certainly keep the squirrels well-fed. Their beautiful bark is also quite welcome, as is their compound leaves - I really don't have much that has compound leaves, so this adds diversity on several levels. Here being the spot about three feet from my driveway and ten feet from the garage wall; there being a spot about thirty feet across and ten feet down the driveway. The leyland cypress - about five or six feet tall now, and planted on my birthday a couple of years ago - was the long distance voyager. With dragonflypug's son's help, Justin and I dug a hole (too deep, it turns out,) moved the dirt across the driveway, out of the wheelbarrow, and onto a tarp. Then we took turns circling the tree with the one spade. Eventually, we could get in there with the transfer shovel and use it to help lift. After a couple more times around, we finally began to be able to lift the rootball out. We carried it across the driveway, discovered the hole was too deep, and had to go bring the dirt back over. This involved all three of us lifting the tarp and dumping three cubic feet of dirt back into the wheelbarrow - my back will thank me for that later, I'm sure. Once we got a few shovelfuls of dirt in there, it sat nicely, and it actually went pretty smoothly. Now we just have to move the wisteria tree, the crepe myrtle, and the heaths and heathers. I know that the last two are going on the back bank - this will be an improvement as they will no longer compete with tall grass and they will hold the hillside where grass doesn't want to grow. Win-win. The crepe myrtle dies to the ground every year - I'll put it somewhere along the foundation, maybe close to the dryer vent, to help it get some more warmth and more of a chance to flower and survive. The wisteria needs sun and, to keep the tree form, high maintenance - not really sure where it's going to go, though. After they are all moved, I'll be able to let that entire area become part of the meadow, which will greatly simplify care of the meadow and pruning of the wisteria. Well, they actually do have something in common: my yard. In no particular order, I discovered a second of the winterberries is, in fact, a she and not a he. Luckily, the one in a prominent position in the center of the Stone Stream island is, and she had two potential offspring that grew bright red - and then were hacked off, along with a bit of twig and a mouthful of leaves, by one of our white tailed rodents. The other, just discovered today, has only one fruit, but it has thus far evaded the hooved herbivore Hoovers. Justin thinks a bear ran by him while he was down getting the trash barrels earlier today. He says it was the size, shape, and ran like the one we had seen last week. Only it was white. So. Looks like I might be able to get some ammunition for that RPPB that was discussed on TH last year some time. Of course, stuffing a polar bear - even a smallish one - into the rocket shell is always the challenge, and it's best to buy the stuff fully loaded. Or just to stay away from the whole dubious concept. Deb is of the opinion that it was a wolf; I suggested coyote at first, as they're known to frequent, well, everywhere. White, however, isn't a likely color for either one or the other, although I suppose it's more likely than an albino black bear. Even more likely, is that it was a large white dog. Think I might even have seen one somewhere in the neighborhood before, which makes it even more likely. Justin and I survived the first round of planting this season - the Forest Farm order arrived on Wednesday and that night I opened the boxes and set the plants out to stretch their roots as it were. They received a nice, gentle deluge, partially sheltered by the eaves, the kiwi trellis, and the juniper. We planted last night. Most of the ground was still damp, so after-planting watering was minimal; just enough to mix the top bit of soil together. Might have been some rain last night, and it's raining off and on today, so that should help them transition. Last year we focused on the foundation area, this year the focus is on the meadow and Chestnut Grove, with all but one of the planting being in the grove or on the fringe of the meadow. We had four 1 gallon plants: a Podophyllum pellatum (mayapple, mandrake) that is planted between an oak and the Stone Stream just below the island - I'm hoping the perennial spreads out and takes over the undergrowth of that area, along with the native blueberries, wintergreen, and azalea; a Clethra alnifolia (summersweet)is opposite that on the wet strip of lawn just before the meadow starts - it should turn into a 10-12'-in-all-directions sprawl that will help define the meadow border and drink up the extra moisture so it doesn't ruin the septic system; and two Miscanthus sinensis 'Zebrinus' (zebra grass) that are positioned on the meadow edge and, with the existing one, will form a trio to screen the view of the cement septic access from the front porch. The six tubes also contained only three species: six Xerophyllum tenax (beargrass) were planted along the Chestnut Grove top corner of the sand mound (which is part of the meadow) - they'll blend with the seeded plants from the meadow, but I anticipate them dominating that one corner; three Asimina triloba (pawpaw) are in Chestnut Grove, they now outnumber the chestnuts in the grove - these are the first of a number of pawpaws I plan on having, as they're key components of the edible forest; finally, one Cercidiphyllum japonicum (katsura tree) was planted down on Bank Island, between the crabapple and the Washington hawthorn - I really like how the one we planted last spring looks, whereas that one will provide shade/color/Autumn caramel scent to the front porch and yard, this one is positioned so that people will be able to enjoy it while walking by.